VocaParty: Happy 1st Anniversary Senbonzakura! It's 17th September, 2012 today. Not a very notable date to the rest of the world, but for those of us who watch the Weekly Vocaloid Ranking and keep up with Vocaloid trends, today marks the 1st Anniversary release of the wildly popular and excellent Senbonzakura 「千本桜 」 by KurousaP (黒うさP)! Senbonzakura was uploaded by KurousaP at 7pm (JST) on the 17th of September, 2011, with art done by 一斗まる (Ittoumaru) a PV animation done by 三重の人 (Mie no Hito) . Since it's release, it has gained immense popularity and raked in astonishing number of views, reaching 4 million views at 3.49am (JST), August 12, 2012. 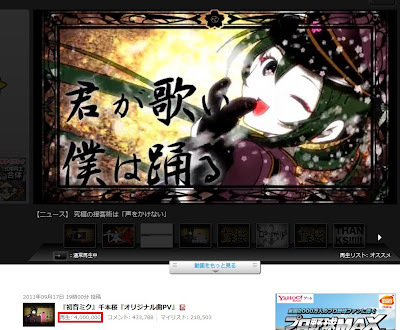 One year down the road, asides from reaching 4 million views, Senbonzakura has also achieved the incredible feat of persistently maintaining a position in the Weekly Vocaloid Ranking up until today. 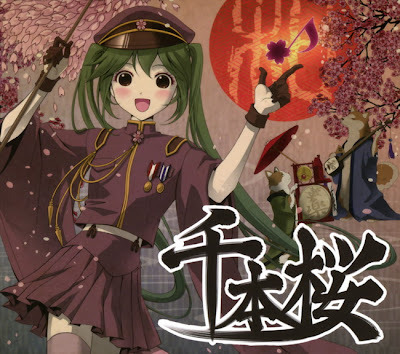 There are a number of interpretations as to what the song's implication is, there's debate as to whether the song and setting is based in the Taisho era of Japanese history (Pre-World War II), due to the art, or after the war, due to the lyrics " 磊々落々（らいらいらくらく）反戦国家", which implies that Japan is a pacifist country (obviously not the case during WWII). 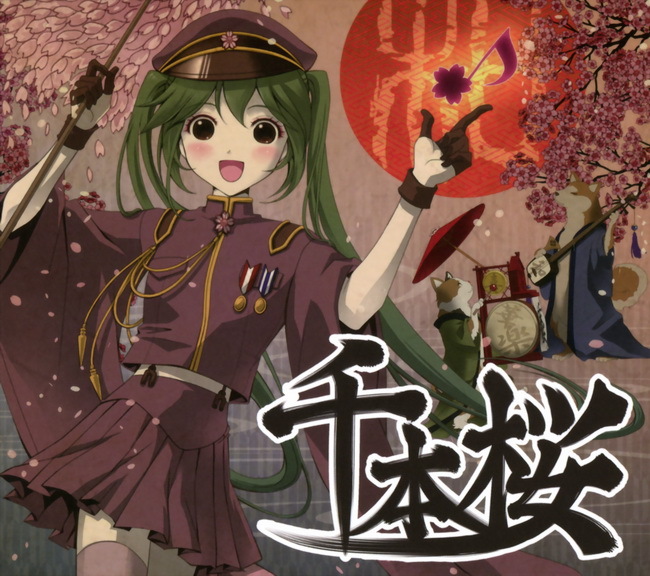 Whatever the case may be, it can be said that the song is about Japan in general, which has inspired some nationalistic attitudes over the net (Evident by Gurutamin's cover above). Coupled with the fact that the song itself is incredibly upbeat and catchy, has an excellent PV animation and art, Senbonzakura has become a fan favourite in all manner of Vocaloid-related media, from Utaite (Covers), to Odorite (Dance Covers), to fan-art, and of course, to cosplay. To commemorate its 1st Anniversary, an album titled 「1周年記念アルバム ALL THAT 千本桜! !」( 1st Anniversary Album ALL THAT SENBONZAKURA!!) was released on the 12th of September. The album includes the original song sung by Miku, and various other instrumental compositions versions. Also, earlier today KurousaP tweeted that Senbonzakura is to have a novel publishing! (Kudos to Reigan for sharing this information). No details yet on how the story will be, except mentions that there will be Miku and Len in school uniforms designed by Ittoumaru, the original artist behind Senbonzakura's art. There are also speculation that the Vocaran committee are planning something related to Senbonzakura for this or next week's Vocaran, so stay tuned to see if those rumours are true!